where it dried on the radiator shall we?! I did a bit of straight line quilting in between the blocks and this is the first quilt I have done a 'proper' free motion quilting pattern on, inspired by Leah Day's Echo Shortcut design. I enjoyed every second of it - except the part when I realised I'd done one block with cream thread on the back instead of the coordinating thread I was supposed to be using (that's what happens when I leave something a couple of days and come back to it!!). I was not about to unpick all the fmq so the mistake will have to live there - it's not too horribly noticeable and just contributes to the 'not so charming' aspect! The backing was given to me by my mum and I've fallen deeply in love with it despite it not really being my sort of thing at all!! I'm happy with the new addition to our house and nearly keeled over when my husband actually said that this is his favourite quilt I've made so far, partially because he thinks it "looks like it took skill". Compliments indeed, he seems to have fallen for it's charm too! After seeing the lovely Dala pouch she made for Nicky and knowing she's trying to raise funds to come to the Fat Quaterly Retreat in June, I commissioned a pouch of my own! Having said that though, it's blinking cool!! I love the pigs on the back and I LOVE writing so the simple 'fugly' on the front and label on the inside are perfect. She also included some little treats, a cute felt heart and sweet little button brooch that my daughter thinks is magic! Thank you so much Emily! Also take a look at the Fugly Fabric Party, which is here on Tuesday - there's a nice giveaway too! 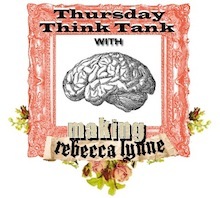 Linking up to Thursday Think Tank even though it's Friday here! (there's been some drama, go show Rebecca some love), Finish it Up Friday at Crazy Mom Quilts, This Week@Love Affair with my Brother and TGIFF, which is being hosted by the fabulous Erin who has made a cute Blanket of Love this week! hey Lucy I love your quilt!!! it is gorgeous and so bright and your FMQ is fantastic! I remember the first few weeks of Cindy's FMQ class and now look at you! I adore that backing fabric too. Gorgeous! I love your star quilt!!!! I think I will have to make me one :) It looks like the perfect quilt to practice FMQ on. Yay for finishing the quilt, and fab parcel from Emily! that quilt is CHARMING :-) you did a great job. I have my husband comment on my quilts too, he loves them all but often his favorites are the simple ones that took no time at all, where I look at the work that goes into some of them and prefer those. I LOVE your quilt and it's FMQ! What a tremendous success! Well done Lucy! Also in love with Emily's fugly pouch - may have to save some of my fugly fabric to make myself one! I love your quilt, and such a good Fugly pouch!! A brilliant idea to raise money! Does that mean you are coming down to London? We need to meet up! I never would have noticed that crease! I like that backing too, although I don't know if I would choose it myself either, thank goodness for moms! Well the Fugly isn't fugly, so watch out under Trades Description Act! So glad the quilt turned out so well in the end - you are probably going to need it this weekend!! Yay for such a great finish, Lucy! Your FMQ is excellent! Visiting through Crazy Mom Quilts. Love your quilt -- so, so cute and plenty charming if you ask me! Don't be so hard on yourself- your Stars Quilt is charming! And I can see why you love the backing fabric! Beautiful! I agree. You quilt is perfect. YAY! It is beautiful Lucy. I love that FMQ design too... might have to be one of the first I attempt to master. Ahh... what a scary thought! Thanks for linking up to TGIFF. I'm glad you got it finished in time to show-off. Your husband has good taste in quilts. And the Fugly make is ace! Hope Emily makes it to London with the rest of us. It is going to be so good. Lucy, it's spectacular. Absolutely lovely. Oh Lucy your quilt is so pretty! Love the colors! That quilt is a beauty. And I'm with you, I love the back almost as much as I like the front! I think I am going to be joining your Fugly swap... Have to scrape up some scraps. I'm your newest follower! If you get a chance, come see my blog and if you like what you see, follow me! Not So Charming Rainbow Stars Quilt - great looking - fun that you FMQed with Leah's design help!